Update | A technical fault forced the BBC to suspend live news programming and move its flagship news bulletins to Millbank. A software failure, which occured earlier in the afternoon, initially caused the loss of live output on the BBC News Channel and BBC World News between 3 and 4pm on Wednesday afternoon. Recorded programming was shown on both TV channels. BBC World Service Radio switched to a back-up system. At 4pm, live programming resumed, but the normal Afternoon Live slot on the News Channel was replaced by a basic desk-bound news bulletin, with the news "catwalk" unavailable. At 5pm, BBC World News reverted to repeating the 4pm edition of Global, as issues persisted. As a result of the systems meltdown, BBC bosses moved its flagship early evening bulletin, the BBC News at Six, to its Millbank (Westminster) studios, leading to presenter Fiona Bruce featuring in a police-escorted taxi ride from the BBC's HQ at New Broadcasting House. 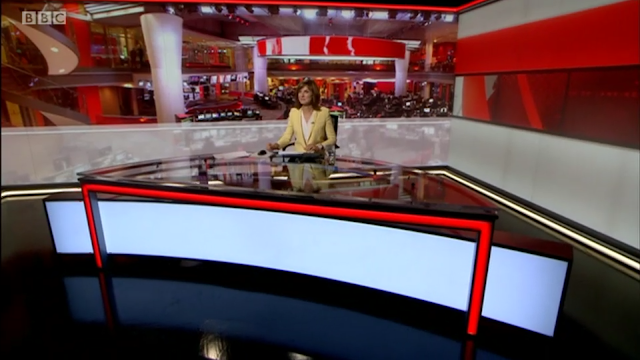 The news was presented from the set of BBC Two's Politics Live (pictured above), but with a back drop of the newsroom at New Broadcasting House. Four hours later, the BBC News at Ten was also broadcast from the temporary set-up. The software at the centre of the issue is OpenMedia from Annova Systems, which the BBC began using in its newsrooms last year, beginning with a pilot in the West Midlands before going national. The OpenMedia newsroom system supports both digital output and linear broadcasting, as well as delivering agency wires and enabling users to manage all input and output in the broadcast newsrooms.